Have a massive thirst? 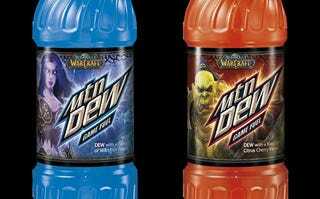 Consider it slayed, as Mountain Dew (aka Mtn Dew) and Blizzard have officially made the soda based on World of Warcraft available, in either citrus-cherry-flavored Horde Red or wild fruit-flavored Alliance Blue. The previously announced sugary concoction should be raiding store shelves near you, according to word from PepsiCo, offering players a chance at an in-game pet, known as a "battle-bot." It, like WoW players jacked up on Mountain Dew's caffeine, is fueled by Dew. The limited time drop of the new soft drink also gives fans a chance to win some 8,000 prizes—including Alienware Notebook computers and Razer Gaming Peripherals—en route to teeth rot, diabetes and delicious satisfaction. Pepsi reps say the Horde and Alliance flavored Dew gives players "a new way to experience World of Warcraft and a new way to experience Dew." On the Blizzard side, COO Paul Sams says drinking the soda offers "a new way to show their Horde or Alliance pride out in the real world." We say it's just good business! Drink up!